The image is from Pink Cat Studio. She is so cute! Love the color combination. 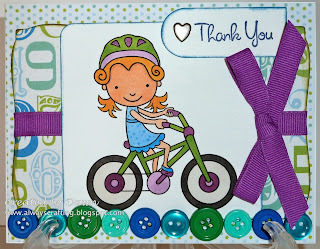 And love love buttons! Great colors. And the buttons are so cute for the road!!! Cute image, great colors and the sentiment is perfect! Thanks so much for joining us at Wee Memories this week. Cute Dawn! Love the buttons. SO cute! Love the buttons! Thanks for playing along at Wee Memories!